Abner Flores, 31, and Raphael Batis, 20, are the two farmers who are maintaining a special 1,000 square meters of land in ABS-CBN’s Eco Village in Iba, Zambales. This lot of land is a demo farm. Within a thousand square meters, one will see a sustainable, year-round organic farm planted with different like lettuce and carrots, as well as different kitchen herbs and spices just like Stevia, a natural sweetener, Rosemary and Oregano. 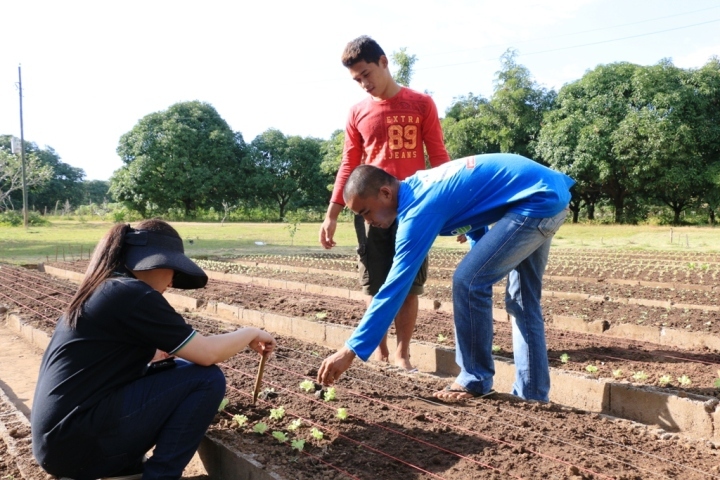 Raphael and Abner teaching a guest of Eco Village how to plant Green Ice lettuce. The farmers plant to a two-week cycle of Plant-Grow-Harvest. Every afternoon, the two farmers sit to plant a row of seedlings. Every day, they water the plants, and feed the pigs, chickens, and fish. Inside their little “mud house” they take a break from a day of hard work before they go home. Every two weeks, they harvest the produce then fertilize the plots again with compost and vermiculture processed on site. By showcasing the construct of a demo farm, 20 people directly benefit from its produce and this includes Abner and Raphael. The latter shares, “Pwede po kaming kumuha ng mga gulay dito sa farm para kainin.” (“We can get vegetables from the farm which we then eat.’) With the demo farm, they no longer need to buy vegetables from the market and what they are getting are healthier since all of them are organically grown. The demo farm in the Eco Village became possible with the partnership of ABS-CBN Lingkod Kapamilya Foundation, Inc. and Toshiba Information Equipment Philippines. Last June, TIP donated 500,000.00 pesos to plan, develop and construct it as a part of their corporate social responsibility. Recently, its company heads visited the Eco Village to formally open the demo farm and to turn it over to Abner and Raphael for daily care. President and Director of TIP Hiroshi Okamura (right) and Executive Vice President and General Manager of TIP Canlubang site Toshichika Takahashi (left) near the fish pond of the demo farm.TIP Heads together with ALKFI Managing Director Susan Afan, Cristina Tabora (ALKFI Iba, Zambales), Jing Castañeda-Velasco (ABS-CBN News Reporter) and husband Nonong Velasco, together with the employees of the Mango Grove at the Bancal River. With the small-scale layout, the farm aims to be a model farm to the residents of the ABS-CBN Eco Village by actually demonstrating how they can build their own in their backyards. It doesn’t have to be as big; just smart. The project’s vision is for each resident to have his own farm, and thus alleviating poverty in the community as it becomes a source of income or living. Abner said the demo farm was a blessing for him because it was the reason why he now has a job. One day, Abner and Raphael look forward to sharing their skills in farming with the other community residents, and helping each other to make their lives better. This December, ALKFI plans to launch a feeding activity every Friday where in the kids of the Eco Village will be the beneficiaries and the food that will be served are veggies from the demo farm. ABS-CBN’s Eco Village is a resettlement area for Mt. Pinatubo eruption survivors located in Brgy. Palanginan, Iba, Zambales. One can escape from the hassle of the city by visiting the site and experience organic farming, kayaking on the Bancal River, archery, and taking a peaceful break at the Mango Grove at the Bancal River Guest House. To plan your next trip to the Eco Village, contact G Eco Tours at (02) 904-5066 or email at [email protected].